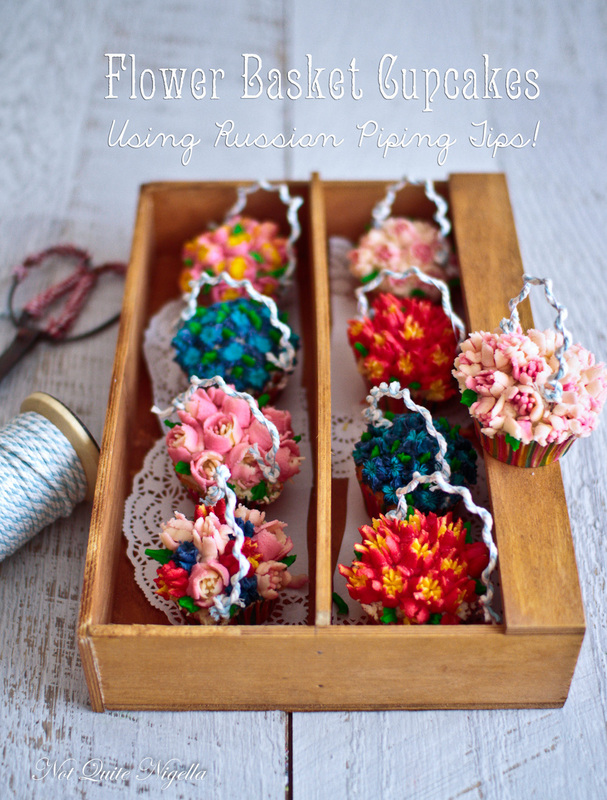 From Russia With Love: A Russian Tip Piping & Flower Basket Cupcake Tutorial! Okay so perhaps you thought that buttercream flowers were a bit too hard. I get that totally. It takes nerves of steel a dash of confidence to pipe flowers petal by petal. 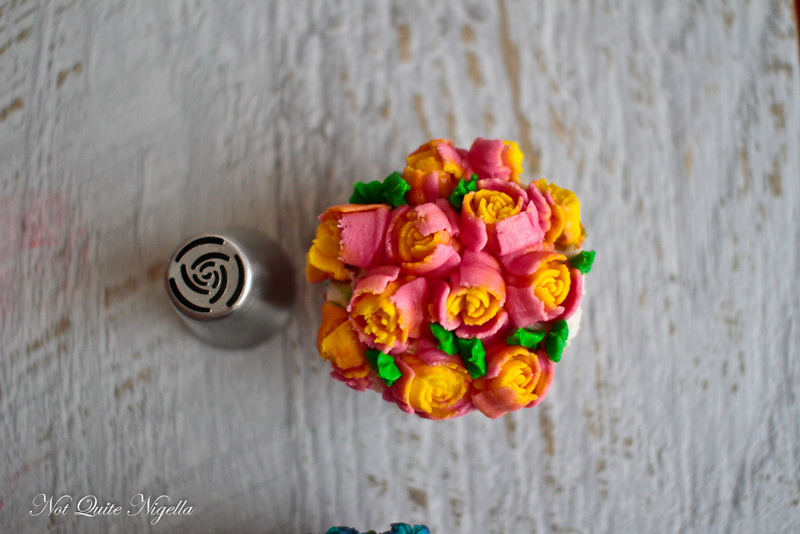 But did you know that with Russian piping tips, you just need to squeeze once and a beautiful flowers appear-just like magic! Russian tips apparently originate from Russia (no kidding I hear you say). 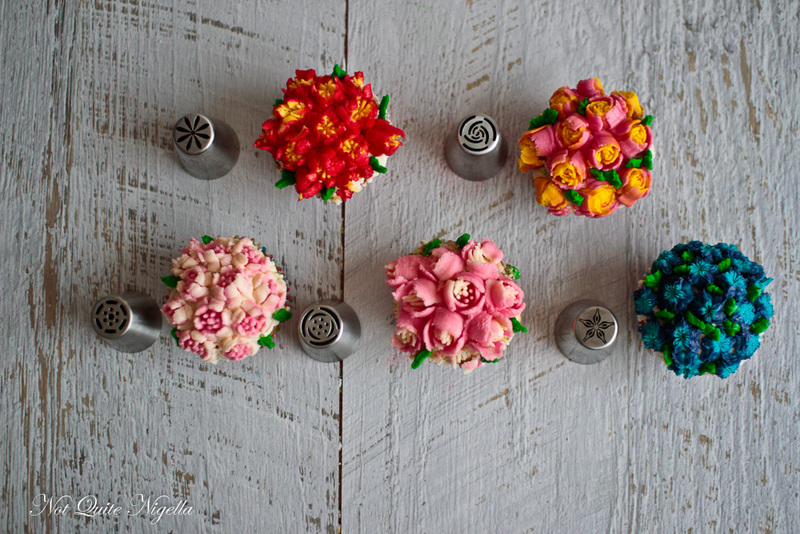 There's not much history that I could find about where or why they originated there but nowadays if you do a search for Russian piping tips, there are plenty of sellers that sell them at cake stores or ebay. I got this set from my friend Louise who bought a set and loaned them to me. She fished them out of her bag one night during dinner and said, "Have you ever tried these?" I hadn't but the internet was abuzz with these so I happily tried them out. 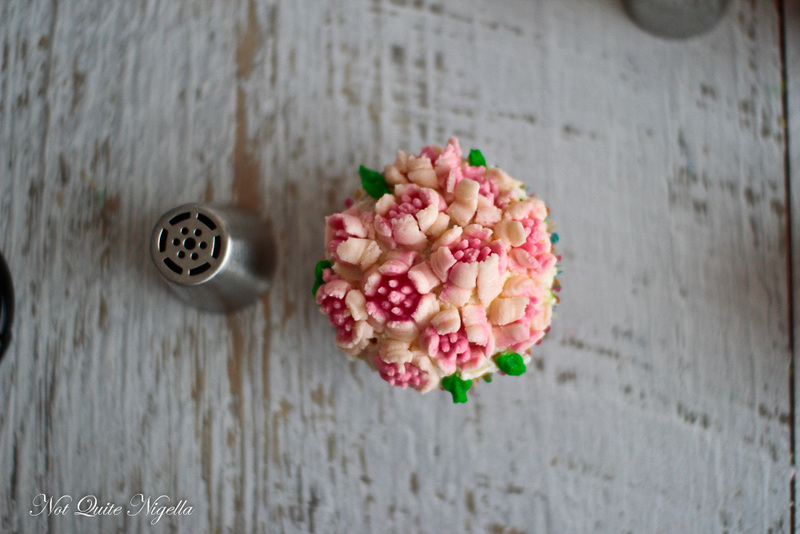 The tips are much larger and heavier than standard piping tips and you can sort of approximate what each flower might look like if you are familiar with piping tips. They're also inexpensive and sold in lots of 7 or 8 so that you can try out a few different styles and find one to suit. Confession time: I have to admit I had three goes at these. The first one was with the silky buttercream in this recipe. Folks, as much as this is my new go to buttercream, this will not work for Russian piping tips. Trust me on that. It's too soft and creamy. You need an American buttercream for that as it is stiffer and holds its shape. The second attempt was without spreading out the buttercream on a sheet of cling film and then inserting it into the piping bag. Instead I put some outside the piping bag and then some inside the piping bag. However the buttercream is a bit too stiff and the plastic piping bag burst everywhere. I swear I was cursed. I was now up to my third attempt, and by now our apartment was coated in a layer of buttercream, icing sugar, colour gel and butter. But this time it worked! The flowers miraculously "bloomed"! But so you avoid any similar problems, I have some tips for you. 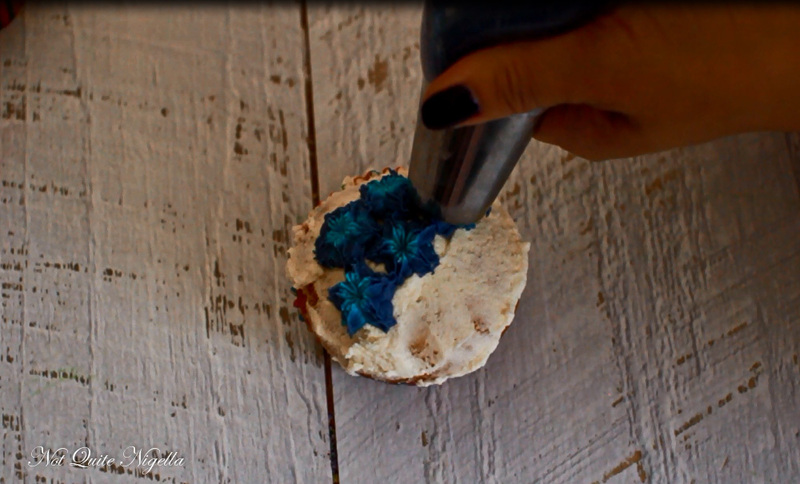 1 - You need to put buttercream on the cupcakes to allow the flower something to stick to. 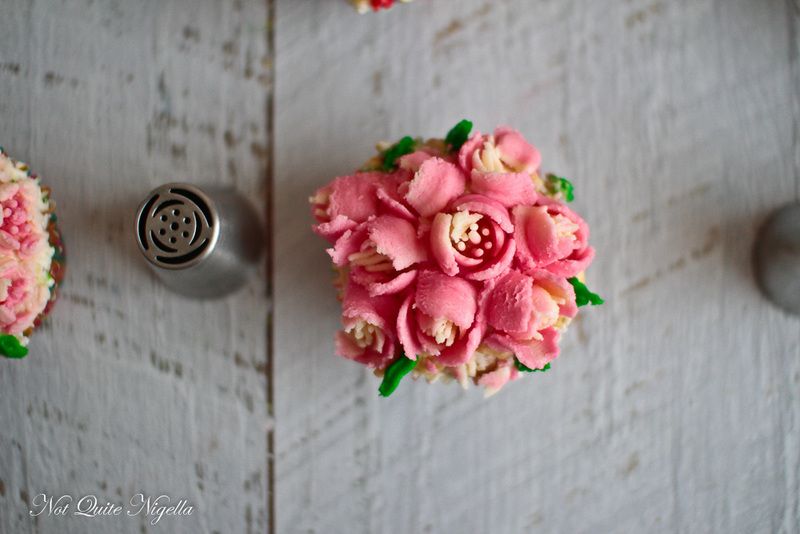 While American buttercream is what you need for piping these flowers, it is is not so spreading on top of the cupcake unless you put it on straight away because it forms a crust (as it should). I used a batch of the silky buttercream to spread on top of the cupcakes since I had a batch from the first attempt. 2 - Pipe the flower very close to the buttercream so that it does attach. It may sound silly and obvious but sometimes when you're trying to pipe you're too busy concentrating on one thing and can ignore something basic. Like blinking. I don't blink when I pipe as I'm too busy concentrating. 3 - Each piping tip requires a different level of pressure and can handle a different height. Some are made to create high flowers, some are not. Practising will help in that regard. 4 -To that end, your second cupcake will look better than your first as you'll get use to the piping tip pressure and height. But overall I am really impressed at how pretty the flowers were. There were a couple of tips in the lot that weren't as good but Louise mentioned that the set that she bought were the odds and ends so they were on sale. If you get a non sale set of the popular ones you may find you like all of them. I'm so glad that she randomly pulled them out of her bag that night. Another friend that randomly pulls things out of her handbag is Queen Viv. The last time she pulled out a cookbook to give to me and the time before that she had a pork recipe. This time she whispered the location of a bountiful mulberry tree near our place. She gave us very specific directions knowing that Mr NQN grew up picking these sweet berries in the country, staining his long fingers purple. Because sometimes friends give you tips of all sorts! So tell me Dear Reader, do you think you would give these a try? Have you ever heard of Russian tips? And what do you carry in your handbag? Anything interesting? 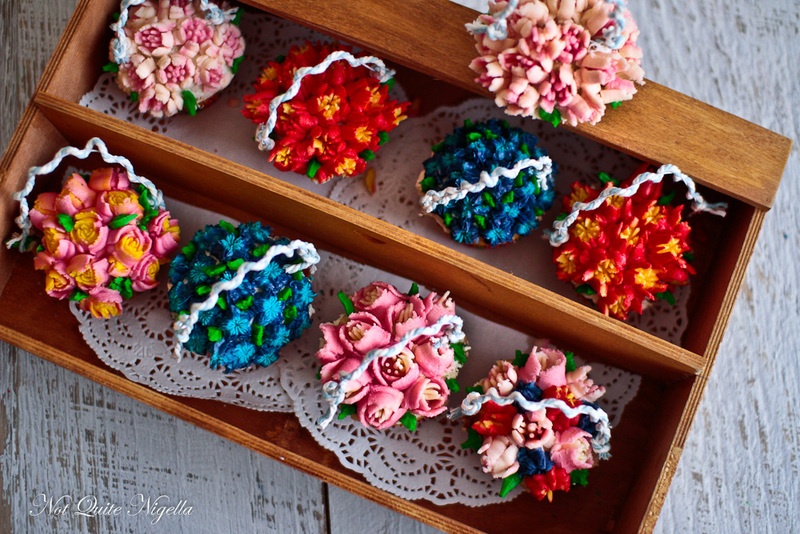 Russian Tip Piping & Flower Basket Cupcakes! Step 1 - Make cupcakes. Preheat oven to 180C/350F and line 2 cupcake trays with 15 liners (or so). Whisk the flour, cornflour, baking powder and sugar in a large bowl until combined. In a jug measure the juice and whisk in the melted butter, eggs and fruit. Make a well in the dry ingredients and mix until just combined. Pour into a jug and fill the cupcakes pans about 3/4 of the way up. Bake for 20-25 minutes until a skewer inserted comes out clean. Step 2 - Fit a beater attachment to your mixer and beat the butter until smooth. On low speed add the icing sugar and juice and then beat for 3-4 minutes until fluffy. You are best to ice these cupcakes just before you pipe them because this buttercream sets hard quite quickly and you need the buttercream soft to affix the flowers to. If you keep them in an airtight container until you need them the buttercream won't harden. Spread them with the white buttercream. Then divide the colours up into six bowls. Colour each bowl with the colours above (or choose any that you like). Cover with cling film. Step 3 - Take a piece of cling film (I used press and seal) and spread a rectangle of the outer colour that you want (leave the green for the leaves). If it helps you can write a guide as to what flower combos you want. Then along the middle of the rectangle make a log of the centre colour. 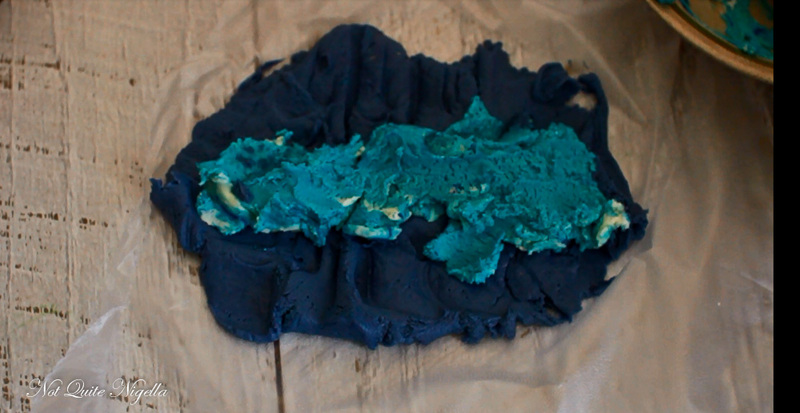 Then gather up the sides and roll it into a log making sure the outside colour encloses the inside log. Snip off one of the twisted log. Place the Russian tip you want to use in a piping bag, snip off the end and then place the log into the piping bag. Pipe a flower a couple of times just to make sure you get the two colours coming out at once. Step 4 - Now Russian tips require a bit of practice. Each one requires a different amount of pressure to it but they all need to start on the buttercream to adhere to it. I found the first cupcake was a bit wonky but once I got onto the second one it went much better. Pipe the flowers as close together as possible. Then place the green buttercream in a piping bag fitted with a leaf tip (there are several #65, 67,74 etc, I used #352) and pipe leaves where there are gaps or just around the outside. If you have found that you have a little bit left in each bag make a mixed bouquet. Step 5 - To make basket handles, take thin wires (available from cake supply stores) and wrap some thick twine around them knotting them at each end and leaving about 1cm or half an inch at each end to poke them into the cupcakes. 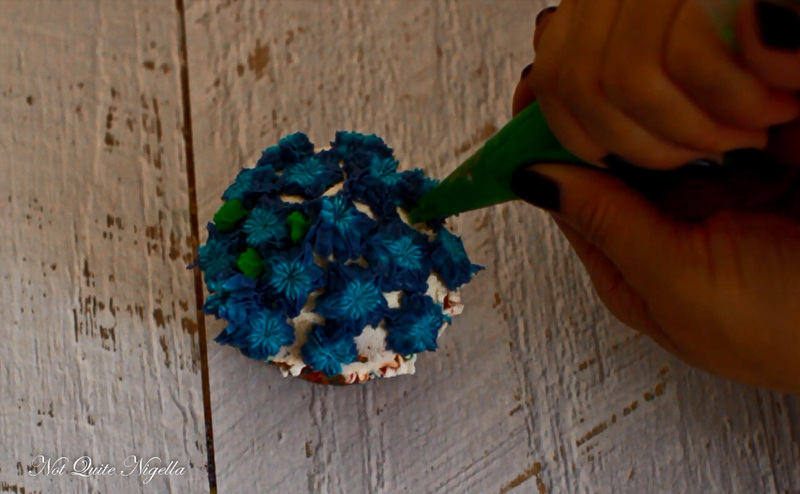 recipePretty Hydrangea Cupcakes for Mother's Day and a Tutorial! 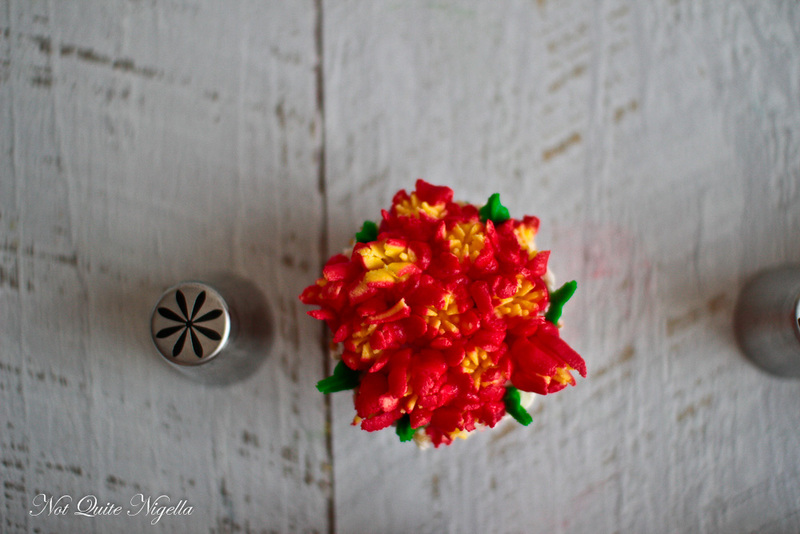 recipeHow To Make AMAZING, completely edible Buttercream Flowers! 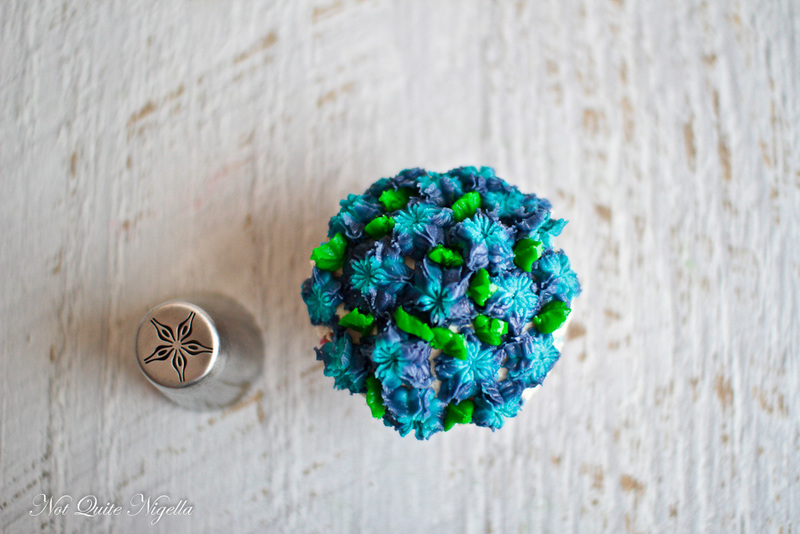 recipe Pretty Hydrangea Cupcakes for Mother's Day and a Tutorial! 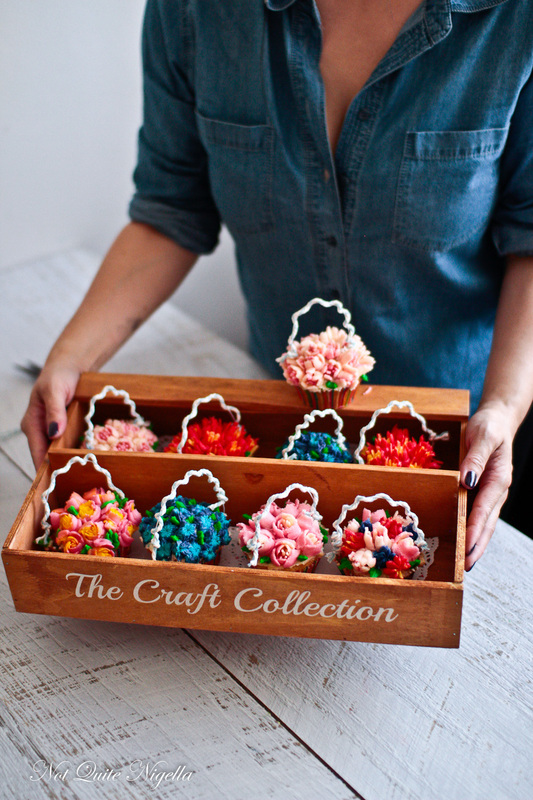 recipe How To Make AMAZING, completely edible Buttercream Flowers! recipe Fun Father's Day Cupcakes!